A pickup truck drivers over rutting in Smyrna Road on Friday, March 15, 2019 in Evensville, Tenn. 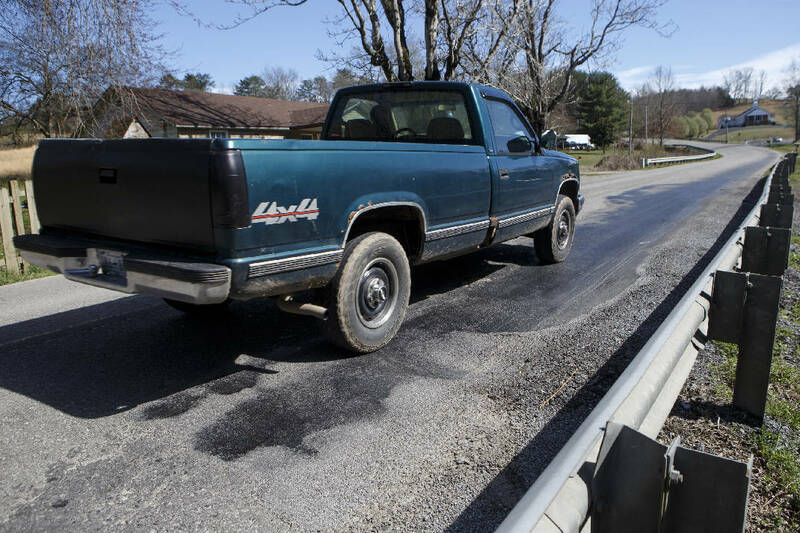 There are two Smyrna Roads in Rhea County: a smooth one east of the Rhea County Landfill and the 2.5-mile-long, pothole-pocked, rock-strewn one to the west, where waste-laden sanitation trucks rumble every day. Neighbors are upset over the condition of Smyrna Road, which leads to the landfill. They say pothole patches never last long and large rocks often scattered near the entrance are damaging their vehicles. They also are concerned about foul odors coming from the landfill, operated by Cleveland, Tennessee-based Santek Waste Services since 1999. Resident Paige Creasman is among them. "At 9 a.m. the other morning, I was on my way to work, and there's constantly these huge, palm-sized rocks — sometimes bigger — in the middle of the road," Creasman said. She said one rock went under her car and "tore the undercarriage cover out from under it." Creasman filed a police report to send to her auto insurance company and had decided not to make a big deal of the incident until she headed back home that day. "There was so much gravel on the road, gravel flew up and chipped my windshield," she said. She was finally steamed enough to call somebody. Creasman said someone at the Rhea County Highway Department told her the county wasn't responsible for the road problems that damaged her car and that it was the landfill's problem. Someone at Santek told her the responsibility lies with the highway department, she said. But Smyrna Road is under the county's authority, according to a spokesman for the facility. Santek spokesman Aaron Elledge said Thursday in an email that while the county maintains Smyrna Road, Santek employees "do monitor and sweep the road multiple times per day and collect litter and debris that may have fallen or blown from vehicles." When it comes to rock and litter on the road, he said, Santek "requires all vehicles arriving at its disposal facilities to have their loads tarped or contained, according to the Tennessee Tarpaulin Law. However, as a private company, we don't have enforcement powers and can only remind our customers all loads must be tarped." Jim Howard, who operates a landscape business, has lived on Smyrna Road since 2005. He says in all that time the road has never been as bad as it is now. "It didn't start getting bad until about 10 years ago," Howard said. Rocks scattered by trucks leaving the landfill "are actually small boulders," he said. And in Howard's experience with traffic on the road, "the lanes are too narrow for those trucks," he said. "There's no telling how many loads of stuff come in there, and [Smyrna Road] can't handle that kind of traffic," he said. "Traffic has increased tenfold since we moved here." Howard said he thought the county executive's office was working on the road problem, but he wasn't certain. No one answered the phone in Rhea County Executive George Thacker's office Wednesday or Thursday or returned messages seeking comment. County Road Supervisor Glen Varner was said to be in meetings when the office was contacted last week. He also didn't return calls. It's not just the rocks causing headaches. Odors wafting from the landfill are another problem, residents say. "The smell this morning would wake you up," said Creasman, who has lived on Smyrna Road since 2016. Howard agreed, but he said foul odors weren't always an issue. Years ago, the landfill was "nice and clean and there was no odor," he said, but "the smell has been horrendous here for the last year or so." The Tennessee Department of Environment and Conservation regulates what goes on at landfills, and Rhea County's facility has had its problems recently. TDEC issued a notice of violation on Feb. 6 and a follow-up letter Feb. 11 related to complaints about odors and for general compliance inspections done Jan. 30 and Feb. 2, agency spokeswoman Kim Schofinski said in an email. "In response to odor complaints received, TDEC increased the frequency of inspections to determine the cause of the odors," she said. "Although TDEC does not have regulatory authority over odors, we investigate every complaint received to identify any solid waste regulatory violations that could potentially contribute to odor problems. "TDEC has and will continue to work closely with Santek to address the violations," Schofinski said. The follow-up letter informed the county executive's office that "six inches of soil must be used daily to to cover the working face of [the] landfill," TDEC records state. The most frequently noted problem was leachate seeping from the waste. Leachate is any liquid that passes through material, carrying some of the material out, in this case kind of a garbage soup whipped up by rainfall. Records show inspectors during their visit noted "strong odors," that "operation problems are contributing to odors" and that the working face of the landfill lacked the required soil layer. When inspectors visited the landfill Jan. 30 and Feb. 2, they found runoff and erosion control violations in leachate seen in a storm water ditch and leachate seeping from the working face entrance road and running into a sediment pond. On Feb. 2, leachate seen seeping from the working face entrance road had a "strong ammonia smell," the Feb. 6 letter states. Elledge said Santek installed an "odor neutralizing system" at the landfill March 15 that is fully operational. He said heavy rains have created problems. "As a direct effect of above-average rainfall, leachate volumes have increased and require additional management practices to resolve," he said. February 2019 was the third-wettest on record, the Times Free Press reported last month. Elledge said Santek "works diligently to resolve all concerns our regulatory authorities and/or citizens have presented."